Just last week we shared details from an interview with M2 President Naoki Horii and SEGA CS3 Yosuke Okunari that revealed some of the challenges in producing 3D Space Harrier, making it clear that producing a 3D remaster of the arcade classic wasn't a simple process. 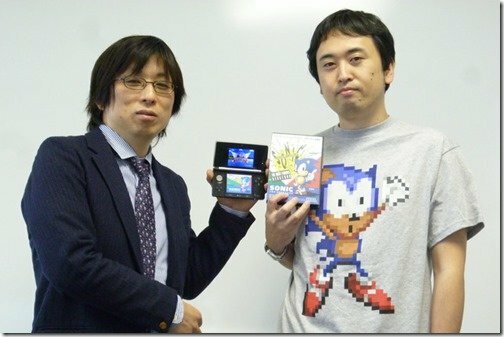 With 3D Sonic the Hedgehog arriving in Europe and North America this week, a follow up interview originally conducted by Impress Watch (and translated by Siliconera) has now been released to cover the process of that release. Unlike both 3D Space Harrier and 3D Super Hang-On, which were both based on arcades, this week's Sonic entry attempts to apply the 3D magic to a Mega Drive / Genesis title. The challenges were substantial for that due to multiple reasons; turning a 2D game into an enjoyable 3D experience is an issue in itself (unlike the aforementioned arcade titles that both had 3D camera perspectives), while on a technical level there were problems running a Mega Drive emulator on the 3DS. In order to get around these problems the M2 team did something rather impressive — it created a new "virtual" console. In many senses it's actually an all-new system, except of course for the fact that it currently only exists in emulated form; with that said it could in theory be built and be a real console, with the team labelling it as a GigaDrive. NH: From M2’s standpoint, since we’ve gotten away from the original plan to emulate the game in 3D, and instead wound up creating an extension of the hardware spec that makes it easier to put MegaDrive games into 3D, we think of the GigaDrive as an ‘unofficial’ new SEGA console. The specs are very clearly defined, and someone out there with enough skill could make probably make the same hardware. That’s the level at which we’ve built it. In other words, if you (virtually) popped in a GigaDrive cartridge, you could play Sonic in 3D, and if you took an old MegaDrive cartridge and put it in, you could play that too; we’ve built it with that type of cross compatibility in mind. Elsewhere in this interview, it was explained in detail how the Sonic Dash was added to the game; originally the move made its début in Sonic the Hedgehog 2. YO: We’ve made the stage select a standard feature because we want players to see every stage, and for the people who gave up on the original to come back and give Sonic another try. One more thing is the Spin Dash. This was actually a lot of work to put in. These days, everyone knows the Spin Dash from modern Sonic, but it wasn’t in the very first game. So when people go to play the first game, they’re like, “Wait, what?” (laughs)They always try to Spin Dash right away. ...YO: Yeah, after M2 worked so hard to get the move in, they told me they wanted to make the Spin Dash the game’s “Special” feature. But I said, “No no no, in this day and age, people expect the Spin Dash. We should just slip this into the main game.” No one’s likely to turn off Spin Dash, other than those who just really want to play the complete original version. Not nowadays. So we quietly included the option to turn Spin Dash off in the back of the system options. NH: And I was fine with that… Okunari-san always comes to us with these sorts of proposals, and we’re more than happy to implement them. But then… when we tell him, “Hey, um, you know this is going to take a while, right?” and start talking deadlines, he’ll tell us: “The deadline is iron-clad. If it’s not going to make it in time, then we don’t have to implement it.” That’s the spiel, but somehow every time, the changes make their way in…. Okunari-san has a lot of opinions that come from him personally, and not from a producer perspective. And I think that’s without a doubt been key in maintaining the quality of the 3D Remaster Project. As always, we recommend reading the full article, which contains a lot of terrific detail on the development processes and extra features included with the game. For those of you that love the idea of a GigaDrive, below are the specifications that can help make the hardware a reality. GigaDrive (aka Super MegaDrive) Specs, Draft v1.0. In a fictional version of the early 1990s where 3D TVs have proliferated, M2 has finalized the specs for an imaginary 3D TV-compatible SEGA game console, the GigaDrive. The 3D MegaDrive, which will subsequently be released by SEGA, will conform to these imaginary hardware specs. While highly unlikely to ever see the light of day, in the off chance that it does, M2 has taken careful consideration to ensure backwards compatibility with MegaDrive cartridges. In this era, once 3D MegaDrive titles popped up, a fair selection of games were released for the GigaDrive. Hey you!! Why not give SEGA’s new imaginary console a test drive with 3D Sonic? Please note the specs below are in draft form. There will be changes in subsequent revisions. ・Every sprite has a Z-value setting. He looks cool to death holding the 3DS like that. It sounds like a lot of blood, sweat and tears have gone into these 3D classics. I'll definitely be showing my support by picking up 3D Sonic the Hedgehog later on. Now that the GigaDrive is in place they should be able to pump out the second series of 3D classics a little quicker than the first. Fingers crossed the hardware GigaDrive becomes a reality someday. 3D Sonic The Hedgehog is the best 3D Sonic game ever!!! I would like more 3D remasters, Space Harrier 3D is fantastic! i will be getting this today! For some reason, I just hate that Classic Sonic shirt. @Artwark Had to remind us of that blemish, didn't you? DIDN'T YOU! Just had a quick whirl through the Green Hill and Marble zones. It looks and plays great, and there's a ton of different options in the settings menu. Easily the best 3D remake I've experienced so far, definitely worth the £4.09 asking price. Also, no 50Hz slowdown this time around. I wanted to get this, and that stage select sold me on it. So is this coming to NA in today's update? God, I still love M2 so much. I guess I can add yet another version of Sonic 1 to my collection. Seems like it could be the definitive version of the game. @DollyMLegett That seems... how do you say, "legett?" If they can make Knuckles playable, I'l be impressed. @1upsuper The definitive version is still Sonic Jam. Which already had the spindash. (Think the Saturn Space Harrier is probably better as well but I have only seen videos of that. I have played Sonic Jam though). Only way anything better can be made is porting not emulating. (Just what they did with Sonic Jam). I always wonder why they don't ever showcase the 3DSXL in these kinds of promo photos or offscreen footage... I know there's definitely a matter of preference factoring into it, but I honestly don't think I would've bought a 3DS had the XL not come out. And @Blue_Yoshi let's see some sonic and knuckles action. I agree. I wish they had added an option to play it like the Arcade. (Removes the water zones and sets a really strict time limit). I'm glad to see at least sega is excited to be making 3d classics of their games. Um.... YES PLEASE! Would love me a GigaDrive. Sounds like a fantastic idea! Expect a huge uptick on Genesis/MD cart sales on eBay and Amazon! One request... Sega Ages Phantasy Star series in 3D please!!! If you've ever been active in the Sonic fanbase, you'd be shocked at how relentlessly hateful they are to any change to the series. Some even complain about minor things that don't effect the gameplay like Sonic having green eyes. From videos I've seen, unlike the failed GBA remake, this 3DS game is actually a perfect recreation of the original Sonic 1. Go, Sega, show Nintendo how it's done! I love Nintendo dearly but their choices of 3D 'classics'?! I'd still love to see a proper Rad Racer in 3D. I still have my old red and blue glasses from the NES cart. That and some Virtual Boy titles should be easy enough. Didn't Sonic Jam also do the game's programming all over from the ground up with Spin Dash included? Here's to hoping that we see another 8 Sega 3D Classics(Not counting the other 4 not yet released here). Oh, the glorious days of Sega/Nintendo console dominance. I loved Sega just as much, if not more, than Nintendo as a child, primarily due to my unwavering love of Sonic the Hedgehog throughout grade school. New Sega CD console is coming out? Hype! New Sega Saturn is coming out? Hype! New Sega Dreamcast is coming out? Super mega ultra hype! Headline should've just been "SEGA MAKING CONSOLES AGAIN", so we can all hear James spit out his coffee. Yes, all the way from Germany. @EarthboundBenjy Yes Sonic Jam was ported not emulated. M2 seem to deny the existence of those Saturn versions when they claim their own stuff definitive. does this mean more gensis games could make there way on to the eshop? I have the Japanese and PAL versions of Sonic Jam, and if I recall, the reprogrammed version on there has some very minor slow down issues of its own, but it is still a great version. As an 'emulated' console version goes, this 3DS version is perhaps the best I've played, inclusive of Dreamcast, Gamecube, PSP, DS and PS3. It adds the spin dash and the 3D background layers, and includes the revision which added layers to all the stages backgounds, in addition to Green Hill. I find the curved 3D screen option a bit too curved to represent a CRT TV, but its a minor gripe. The definitive version for me is still playing my original cart on an actual Megadrive, modded for 60Hz with SCART output. I'd probably avoid using the Spin Dash in 3D Sonic the Hedgehog, just like I avoid using Copy abilities in Spring Breeze. A NEW SEGA CONSOLE! SEGA RISES AGAIN! @Ristar42 The music on this isn't right. Mobile version is better music. I will test which I think plays better later. The demo's look far smoother on the mobile one though. (Controls are not a problem me on Android loads of options). I don't think this is a particularly good version. (Sound is very important to me). @Raylax I shouldn't be laughing as much as I am from your joke. That spit take would be louder than the shot heard round the world. @unrandomsam I've been playing Sonic 1 on the Genesis most of my life, I've played through the first few 3D Sonic 1 levels today, and was singing along to the beats no problem. They sound just like I remember them. @unrandomsam I don’t like touch screen controls myself in retro games, music sounds fine to me (ha, try the Dreamcast Smash Pack version, or even the DS with its weird pitch shifting instead of sped up music! ), but I've not used headphones. Guess people can watch a vid and see what they think.